Saving Ducklings and Protecting Watersheds: All In a Day's Work for Our Inlet Cleaning Crews! While they may be easy to overlook, you can find at least one of our 75,000-plus storm drains on nearly every street in Philadelphia. 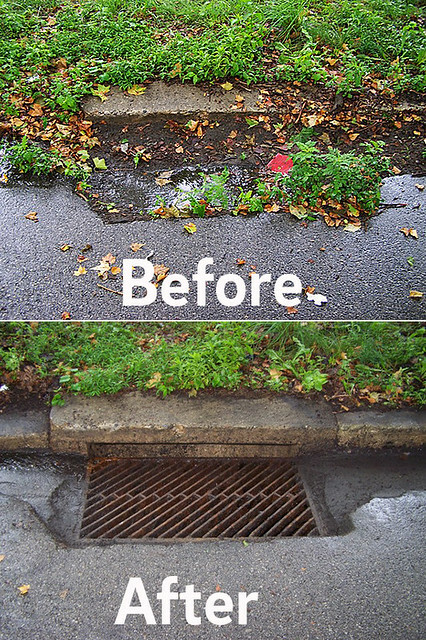 Designed to take stormwater away from our streets, storm drains (or inlets) form a direct connection between our neighborhoods and the watersheds in which we live. What does that connection mean? It means that, when people litter, leave pet waste behind, or let old cars leak oil in the street, that stuff washes down the storm drain and enters our water supply. On the other hand, inlets blocked with trash, snow, leaves, construction debris and sediment can make local flooding worse when we have heavy rain and water can’t drain properly. So, who takes care of our storm drains? And what can residents do to keep pollution out of our waterways and ensure the storm drains work properly? Here to answer some of those questions during Infrastructure Week is William Shields, the head of our Inlet Cleaning Unit. The Great Melt Is Here ... Are Your Storm Drains Clear? Winter Storm Jonas surely lived up to—and even exceeded—all the Snowpocalypse/Snowzilla hype. That meant plenty of sledding and snowman building on Saturday and Sunday when it was cold. But with nearly two feet of snow now starting to melt, our winter wonderland is dissolving into a soupy mess that we want to make sure enters the inlets so it does not create roadway flooding or icing conditions as the frigid temperatures return each night. Flooding seen along Forbidden Drive in Fairmount Park during Hurricane Irene in 2011. In that storm, the Schuylkill River hit a high water mark not seen since 1869. Photo Credit: Philadelphia Water. Whether Joaquin is a hurricane, tropical storm, or something else by the time that system reaches us, chances are we’ll see some intense rain. Philadelphia Water has been preparing for the upcoming heavy rain events by clearing inlets in low lying areas and inspecting other inlets to make sure they are clean. We’re also working to make sure any intersections we know may typically flood will be closely monitored in case they need to be closed off due to high water levels. Our staff will monitor river levels for any tidal flooding that may occur, and have crews working to maintain our systems during these intense rain events. •	Make sure if you live in a flood-prone area that you remove all valuables and electronic equipment from your basement floors. If you have had basement flooding in the past, you’ll want to make sure that items are placed on a shelf at least higher than the last high water mark, or bring it to a higher floor. •	Do not enter your basement if there is standing water, as the risk of electrocution exists. You should always wait until the water subsides. •	Do your best to seal any floor drains, as the water from the sewer would typically back up through the lowest point in your home. •	If you have sewer backups into your basement, you’d want to make sure you sanitize your basement properly. One quarter cup of bleach per gallon of water is recommended to clean all surfaces that any water touches. Make sure you properly dry the basement as well to help reduce the risk of mold buildups. •	You should always have bottled water in your home as well as flashlights and batteries in case of a loss of power. Philadelphia Water always asks our customers to be our eyes on the ground, and you can assist us in spotting any trouble areas we may not be aware of. Should you see a flooded intersection, or if you're receiving water in the basement from plumbing fixtures, call us at 215-685-6300. This information is vital to keep records of flood locations and how these storms impact our systems. We would also be able to monitor those inlets should they be part of the reason for any street flooding, not necessarily sewer backups. If you’re a customer and you experience any basement flooding through your fixtures, you may be eligible for our Basement Backup Protection Program. Call our hotline to get more information on this free program at 215-685-6300. And remember, above all, be safe and take flood and weather warnings seriously!